Although every company says that their human resources are their most valuable asset, some do not always act according to this statement. This article highlights one area with potential for improvement. Self-verification; audits and verifications; and competence assurance are ways in which an organization can ensure the effectiveness of its barriers, whether technical, organizational or operational. 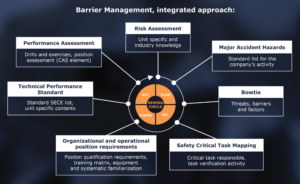 Barrier management involves managing, controlling and handling all aspects of health, safety and the environment via a systematic and continuous approach. It is easy to think of barriers as technical solutions to eliminate operational risks or minimize them to an acceptable level. Technical and operational barriers might be the easiest to implement. 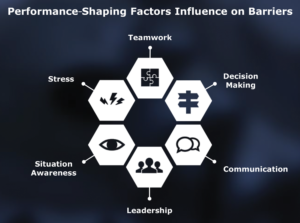 However, unless the personnel involved have a comprehensive understanding of why barriers are established and how they work, they are likely to be less effective. 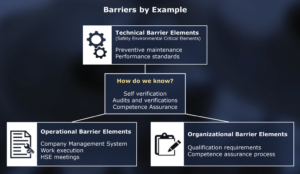 Organizational barriers are implemented through personnel who are responsible for or who have a specific competence, and who are directly involved in performing one or several barrier functions. In all operations, there will always be possible hazards, and no single system can address all possible uncertainties. At the end of the day, it is human decision making that is the crucial test for success. So, how do we know? A precondition for understanding risk and establishing a robust barrier management system is not only to involve people but also to assure and verify that they understand how human factors may directly or indirectly influence the risk picture. This requires taking a systematic approach to identify training needs, build complementary crews, perform practical on-the-job training and develop a competence assurance system to verify learning processes. Practice makes perfect in sport, as well as at work. To establish a barrier strategy, all risks and all possible uncertainties that can be identified by a competent crew should be identified. This means people must be involved. Involving people means to listen, to engage, to open up for discussion and to get all views on the table. Open communication and good cooperation can only be achieved in an environment of mutual trust and openness. Having leaders who can make decisions on the basis of the risk picture and who are supported by all involved are also crucial elements. At Odfjell Drilling, loyalty means to argue and reflect openly for your views, and then actively support the decision when made – to avoid “politics” after the (right) decision is taken. In all activities involving people, one must relate to a number of factors that may be governed by the individual’s situation from time to time; cooperation or lack of cooperation in the team; misunderstood communication; workload; culture; lack of confidence in managers or decisions, etc. People are not always predictable, but essentially everyone is motivated to do the best job possible. This is common sense and may seem obvious; however, leaders are also people and may not always act in the most sensible way. The range and nature of human factors in barrier management can contribute to incidents; an example is the occurrence of “slug effects.” How can such challenges be handled? 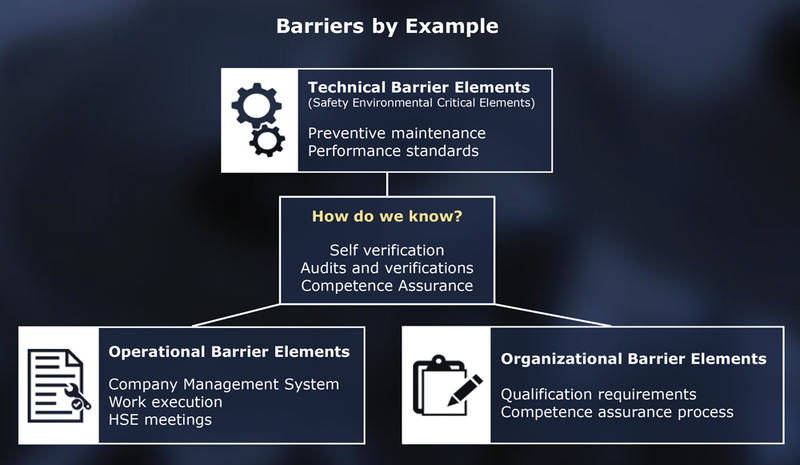 How can barriers be established and maintained so that risks can be managed to prevent incidents to achieve a robust barrier management system? • Daring to speak up. While technical barriers can be verified and monitored by preventive maintenance systems and regular testing programs, organizational and human performance, at any given time, may not be so easy to verify. It is about having people and systems in place to prevent “false truths” from being developed, in order to keep dangerous situations and incidents from arising. Odfjell Drilling ensures robust organizational barriers through training of the personnel at all levels in and in different ways, e.g. e-learning courses in “just culture,” classroom training in observation, and awareness and leadership development programs. At each discipline level, Odfjell Drilling has run different types of simulator training where human performance has been challenged. Well control scenarios from real well events have been programmed into a full-scale simulator and run through with the MODU crew. The personnel are trained in the same teams seen offshore. The personnel have been challenged within key performance factors, such as corporate awareness, team effort, communication, common understanding and the possibility of “false truths.” Following simulator training, a full review of each session is performed with the instructors, in tandem with reflection and explanation about what actually happened in an event offshore. 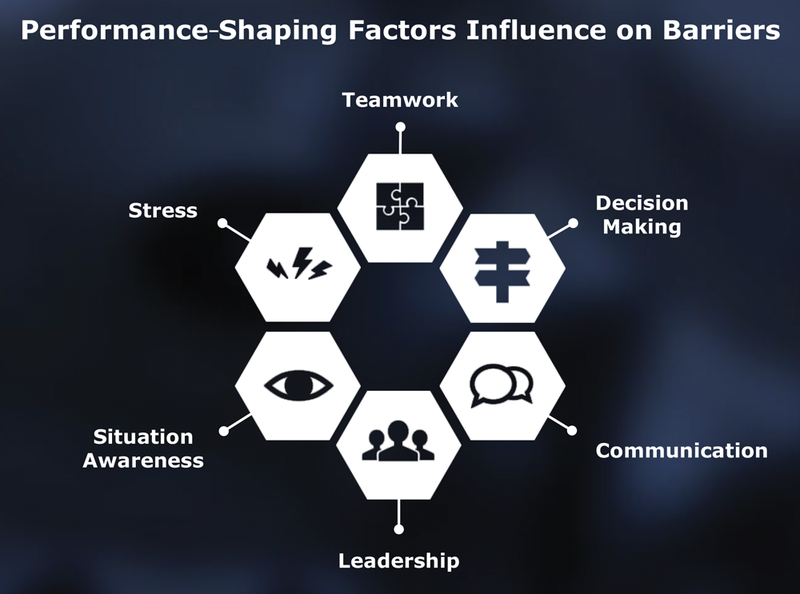 Key performance-shaping factors must be recognized in order to manage the human aspects of barrier management. In general, very positive feedback has been given by offshore crews about these types of exercises. They provide the opportunity for real learning from earlier incidents by simulating the same challenging situation in the simulator and dealing with it in the same team environment seen offshore. Reflection and discussion about what could have happened, how the team handled the situation and what actually happened in this well operation have all provided useful learnings and takeaways for the crew. The significance of personal contribution to a common goal will increase the level of commitment and creativity shown in accomplishing the goal. However, as mentioned, a prerequisite for the effect of such training is full involvement and open discussions by all participants, which requires mutual trust within the team. In this aspect, leadership and management are key factors. Development of people and the organization is a leadership responsibility. All leaders in Odfjell Drilling are responsible for ensuring that their employees are qualified and hold the necessary competence to perform their job. 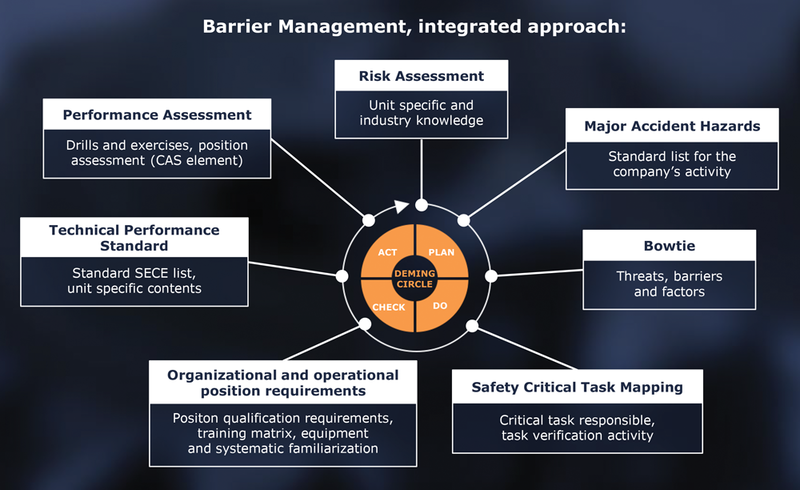 An integrated approach to barrier management involves many elements, such as planning for safety-critical tasks. Safety-critical tasks are the highest-risk tasks that, if not carried out correctly, can lead to serious consequences. Leaders in Odfjell Drilling develop the organization and the employees and create results through delegation, interaction, follow-up and involvement. Leaders on all levels demonstrate accountability. Odfjell Drilling expects all leaders to give and be open to receiving feedback. They communicate in a clear, respectful, motivating and inspiring way, but they also know the value of listening. The employee’s contribution must be seen as valuable by others, especially by the leader. A complete barrier management system contains technical, operational and organizational elements. These element will normally be closely linked and, unless the expected right actions are taken by the organization and the people, technical barriers may be affected or may fail. The whole organization is involved in securing a robust barrier management system, and it requires thorough involvement from all parties. No systems or no human being can be trusted to predict every possible incident in the future, but a combination of good systems, as well as a just culture that fosters optimal involvement, can minimize risks to an acceptable level. The only way to reach and stay on this level is to accept that it is a never-ending story. It’s a lifelong learning process of self-motivation, insatiable curiosity for improving one’s own competence and knowledge sharing. Hindsight might be useful for learning, but it is even better if everyone involves themselves, speak up, reflect and use their competence upfront. Everyone knows best where his or her own shoe pinches, and any company should welcome and prioritize a behavior that is open for sharing experiences and intelligent risk awareness. But this list is not conclusive. It is a lifelong development where new or other elements may become vital for continuous development, and every company must find their own path to encourage their workers and optimize their strategy toward a balanced, efficient and safe operation.